This spread is the beginning of a series of `Alice in Wonderland` spreads and the second spread as I get used to a new layout. 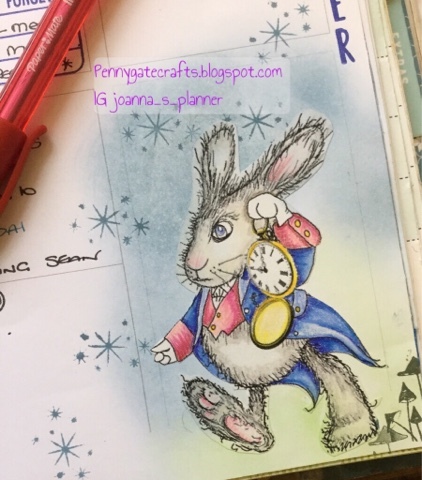 This one starts with the white rabbit who is very late for a very important date. The digital stamps for this spread are part of the `Winnie in Wonderland` series from Polkadoodles. I have used blue as the main colour for this spread using Studio L2E stamps to add boxes. The boxes are to add a little structure to the layout as it is a little to loose in structure at the present time. However, it does give a great deal of flexibility for decorating and scope for lettering. I have not added dates or months to the basic spreads but have used Lawn Fawn plan on it - calendar stamps for the dates, and the Studio L2E tall and skinny alphas to add the month on the right hand side. At the moment I am struggling with the use of Washi as I worry that it could easily dominate the spreads. 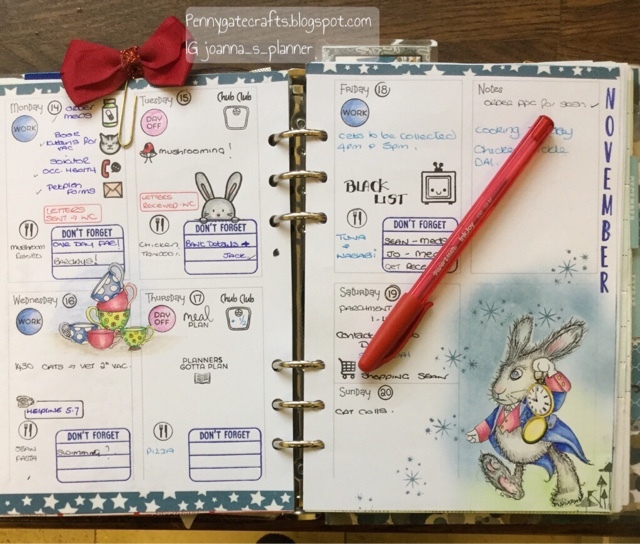 The blue here co-ordinates with the rabbit and and I have used it have instead of some wonderland inspired Washi that is just too red and black for this spread.. The rabbit himself along with the cups have been coloured up using my brand spanking new prismacolor pencil set that was a bargain from Amazon. I have to say though, that whilst the pencils are super soft and full of pigment the colouring up seems to take forever. I am not sure if that is because I have not used pencils in a long time....Somehow think I will be back to markers next week even though the pencils are more convenient for planning on the go. Alice herself features in this the second spread. Again the digital stamp is from the `Winnie in Wonderland` set from Polkadoodles. She has been coloured up with alcohol markers instead of the pencils....using these is soooo much quicker than using the pencils although I do think the pencils are more forgiving. 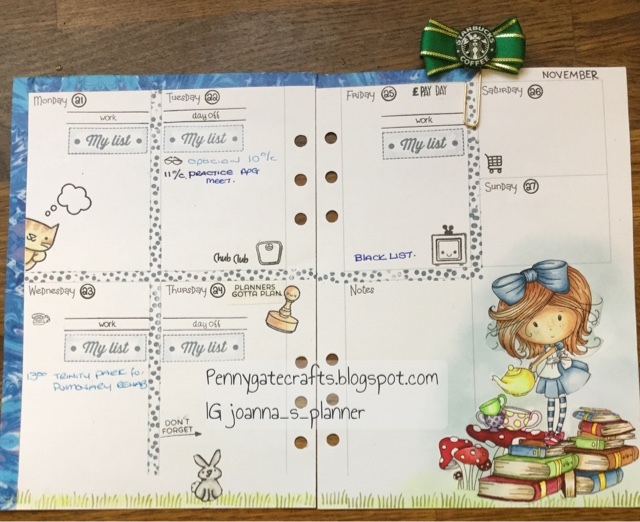 Can you see my super new `Starbucks` planner clip? I got this one in the UK from Megan & Carley at Plannerplumpfairies I am really loving this clip as it fits the page so well. In the past I have had clips that are a little off balance and sit above the page. The sort of clip that falls off in your bag...this one doesn`t and I certainly will have to have some more. Sweet Stamp Shop functional stamps feature in this spread. I am loving my new TV stamp set that I got from a fellow UK enthusiast which reminds me of specific programmes I want to watch or record. I am a great fan of The Black List on a Friday night...those people really are the masters of the cliff hanger. 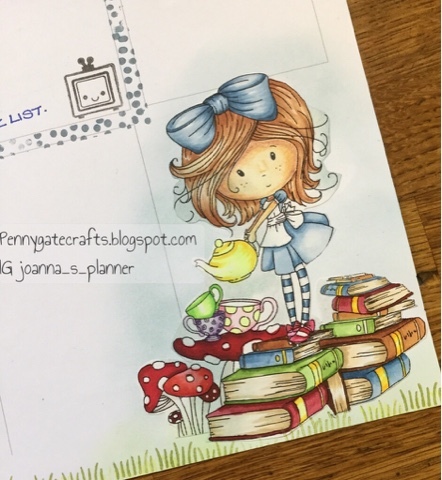 I have also used Technique Tuesday stamps which are easily available in the UK and some of my wonderful stamps from Rowena at Tiny Stamps Big Plans, and yes they are certainly tiny!!! 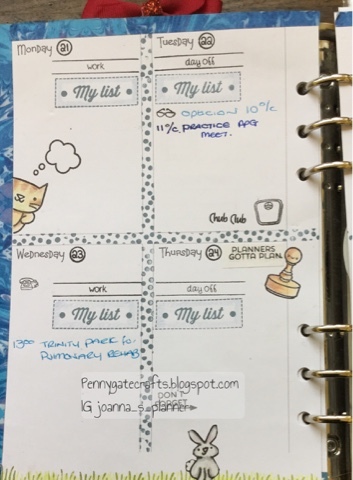 **TIP - If you drop planner stamps on to a carpeted surface and can`t find them, use a lint roller to try and pick them up. This works really well in my craft room. The `My List` stamp from Technique Tuesday seems to work really well in these spreads. I used to find it overpowering in my IWP horizontal but it works exceptionally well here and doesn`t seem to dominate the spread. However, that may be because I chose a softer shade of blue to work with. Changing spreads is a real challenge as I have been working in my comfort zone for quite some time now. It is fascinating to look back at my year of planning to see how the style is developing. having seen the changes and the time it has taken to develop style I can see why planners can find it all very daunting and are often less than happy with their spreads. It really is a case of persevering and finding what works best. 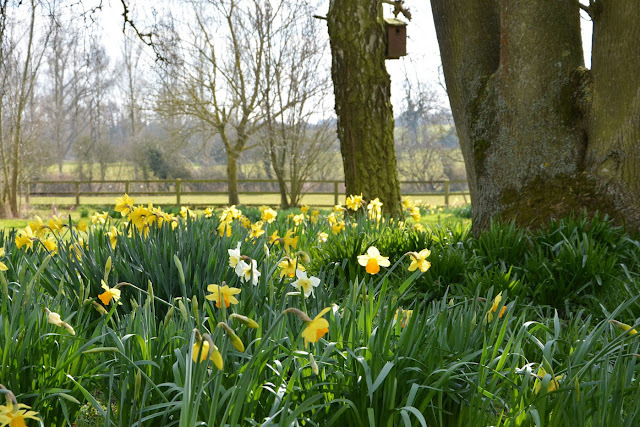 Hoping you are all having a fabulous week and wishing all my US chums a great Thanksgiving for Thursday.